No matter the role you play in the WordPress community, you need to stay up-to-date on the latest news, tools, and more. Designers, developers, and users alike need to find ways to learn and follow WordPress news. Listening to podcasts is a great way to keep up with what’s happening in the WordPress world and hear from others in the community. Especially for those of us with limited time to read, audio can be absorbed while exercising or driving. In just one year, the podcast landscape has changed, with new entrants and some shows cancelled. This article will share a list of the best WordPress podcasts you should be listening to. We have looked at WordPress podcasts before, but we thought you could do with an update. To find podcasts to recommend, we looked at the nature of the content (it had to be primarily WordPress-focused), the quality of content presented, who the hosts are, and how frequently episodes are released. There is no question that the selection of a list such as this is somewhat subjective. We also needed to keep the list manageable, so it is entirely possible that you may have some other useful podcasts you think should have been included. Here’s our list, in no particular order. After turning his small freelance shop into an agency, Matt Medeiros started Matt Report to connect with the community and help other digital business owners start and run their WordPress businesses. In Matt Report, Matt interviews web consultants and business owners about how they run their businesses. WPwatercooler is a lighthearted ‘edutainment’ show, where Jason Tucker brings together various members of the WordPress community to talk about how WordPress is changing businesses and lives. WPblab is an offshoot show, co-hosted by Bridget Willard, that takes a Q and A format with questions from viewers. 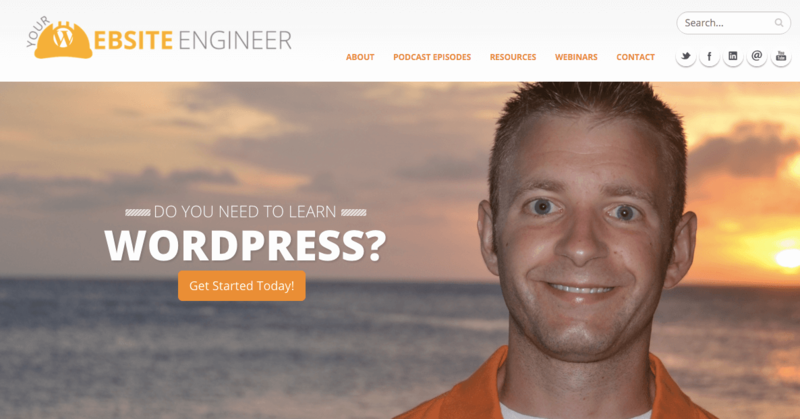 Dustin Hartzler is a Happiness Engineer at Automattic, and he launched the Your Website Engineer podcast to help listeners create high quality WordPress websites. Each week he covers one main topic to help you learn to do one thing. Apply Filters covers everything in WordPress development, and is hosted by Brad Touesnard – founder of Delicious Brains (creators of WP Migrate DB Pro) – and Pippin Williamson, creator of Easy Digital Downloads. They share their experiences in WordPress development and bring on guest developers to tell their stories. Hosted by Dre Armada and Brad Williams (partners at WebDevStudios), DradCast is a weekly video podcast focusing on WordPress news, events, and other topics of interest to the community. Each week, a new guest host graces their mic to talk about the WordPress world. Kim Doyal is the WordPress Chick, and her podcast is focused on helping other entrepreneurs build their business with WordPress. Definitely a non-technical show, she talks about general WordPress and online business topics with her experienced guests. WordPress Weekly comes to you from the folks over at WP Tavern, led by Jeff Chandler (the WP Tavern founder) and Marcus Couch – mega-marketer and WordPress wizard. They take on all things WordPress, featuring the latest community news and interviews, with some smart WordPress people. For the WordPress professionals we have WPcast, hosted by the man behind EfficientWP managed hosting, Doug Yuen, and David Hehenberger, who runs Fatcat Apps (creators of the Easy Pricing Tables plugin). Topics covered are intended to be useful to designers, consultants, developers, and end users, and draw on the experiences of both the hosts and guest professionals. Troy Dean is the creator of the WP Elevation training program for WordPress consultants, so it’s no surprise his WP Elevation podcast provides business advice for WordPress consultants looking to ‘level up’ their business. You’ll get interviews with WordPress entrepreneurs and other online business folk covering topics such as digital marketing and business growth. Adam Silver is a photographer turned WordPress professional who created KitchenSinkWP to share everything he has learned about WordPress over the last few years. He talks about all things WordPress, including hosting and the latest WordPress news and events, plus he interviews some interesting members of the WordPress community. Carrie Dils is a well known name in the WordPress community, and her OfficeHours podcast is definitely a must listen. She interviews a range of folk from the WordPress community who have found business success using WordPress. Other topics covered include her love of the Genesis Framework. If you’re going to have a podcast about building and running a WordPress business, Jean Galea (founder of WP Mayor, and creator of the WP RSS Aggregator and EDD Bookings plugins) and James Laws (co-founder of WP Ninjas) are great hosts. A relatively new entrant to the podcast space, Mastermind covers in-depth topics such as WordPress business models. As the name suggests, WP Roundtable presents a panel of WordPress experts and guests covering a variety of WordPress topics such as development, hosting, themes, performance, and business. It is hosted by Jason Crawford (founder of Mobility Enabled), plugin developer Kyle Maurer, and Operations Manager of ServerPress, Mark Benzakein. The Post Status Draft podcast is hosted by Brian Krogsgard – creator and editor of Post Status – and Joe Hoyle, co-founder and CTO at Human Made. The podcast covers news and information for WordPress professionals, more specifically interviews, conversations, and editorials for the WordPress and web community. Creating its own niche in the space is Do the Woo from Bob Dunn – creator of BobWP and a dedicated WordPress teacher. This podcast focuses on WooCommerce, the leading e-commerce plugin for WordPress, and seeks to provide helpful information for WooCommerce store owners. WP Dev Table is a casual round table style discussion about WordPress development including tools, best practices, and tips, led by its hosts Jason Resnick and Bronson Quick. Discussions are based on the host’s past experiences, as well as those of their guests – with the occasional look at some of the bleeding edge technologies coming to WordPress. Imagely is a company that focuses on creating themes and plugins specifically for photography. You may have heard of their NextGEN plugin which is very popular. Their podcast focuses on sharing tips and advice for creating and managing your photography site with WordPress. Keeping up with what’s going on in the world of WordPress is important to users, site owners, and developers alike. Following the latest news on the industry and its players is a good way to understand what’s happening, and how it might affect you and your business. We’ve shared our list of the best podcasts to keep you updated, so you can pick a few to start following today. There are podcasts to cover various interest areas, from development to running a business. What do you look or in a podcast, and will you be adding any of these to your playlist? Let us know in the comments section below! Ours is fairly new, but the goal of our podcast is to simplify WordPress for photographers. Nice, I’ve added it to the list! Thanks for putting together such a comprehensive list. I’ve listened to all of these at one point or another with the exception of Imagely. Matt Report, WP Watercooler, Office Hours FM, and Kim Doyal are in my podcast favorites list. One other podcast you might consider checking out is WP-Tonic (https://www.wp-tonic.com/wordpress-podcast-national-wordpress-podcast/). Full disclosure, I co-host this show. Our midweek show, we usually do a spotlight guest interview, and we’ve had some of the best and brightest from the WordPress community. On the live Saturday show, we do a round table discussion. I would like to add this one too: https://wpbuilds.com/ 🙂 They are great! Great list. The main concern I see for the WordPress podcasts that are still active is the repetition of the guests. Aside from a few podcasts (like Hallways Chats and Agency Trailblazer) that try to shake things up, it’s literally the same ten people on every podcast every six months. If I could change one thing about the WP podcast ecosystem, that would be it.